I’m intrigued by simplicity. And I’m intrigued by the way the best designers often aim for simplicity … and how that can be the hardest thing to do. For me, it applies to guitars, it applies to architecture, it applies to cooking, it applies to a lot of the things I love. So I wrote a book about the first one of those, and here it is. 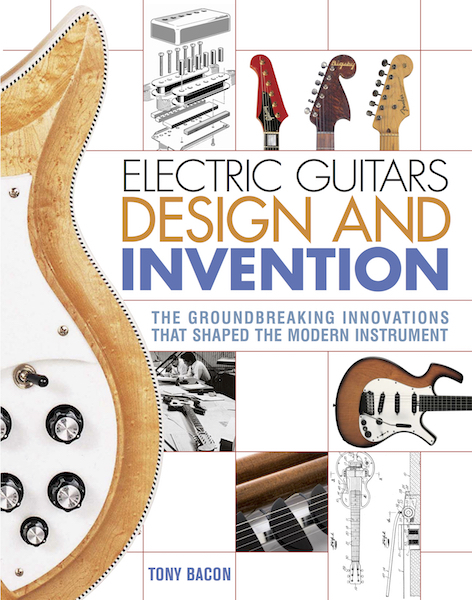 It covers the story of electric guitar design from the instrument’s birth in the 20s and 30s to the crowded scene today. I’ve dug down deep into my research files and looked around at where we are now. I’ve tried to get to many of the interesting bits of guitar design by considering not only the obvious headline instruments – the Telecaster, the Les Paul, the Rick twelve, the Flying V, and so on – but also some of the whackier guitars by people like Antonio Wandrè Pioli in the 60s. I’ve taken on board later developments such as the 80s superstrat by Kramer, Jackson, Ibanez, and others, and I’ve moved the story on to today, among other things dissecting the continuing vogue for vintage reissues and aged relic’d guitars. What I’m aiming for is a new way of looking at electric guitar history. The book includes interviews with designers and makers old and new, with selections from my archive of interviews alongside a series of new chats with Ken Parker, Paul Reed Smith, Grover Jackson, Jol Dantzig, Ulrich Teuffel, Pete Malinoski, and Dennis Fano. You can read an extract from the interview I did for the book with Ken Parker by clicking here. Click here for an extract from the book posted at Reverb.com and which covers Teuffel guitars. And click here for an interview that guitarfactorytours.com did with me about matters around and about the book. Electric guitars have never come about by chance. They look and sound and play the way they do by design. And the people who design today’s guitars draw regularly from the treasury of great instruments created in the 50s and 60s. In this book, I’ve tried to show how those masterpieces happened, why they’re still important, and the effect they have on modern guitar design. Just what does it take to develop and create a classic electric design suitable for the bedroom hopeful or the world-beating rock star?